WHY DOES THE TEXAS MEDICAL BOARD WANT TO DESTROY DR. STANISLAV BURZYNSKI? Supporter Fights Back with Facts! Hannah Bradley-Cohen Defies Doctors...Read her story here. This website was developed by The Patients of Dr. Stanislaw Burzynski, MD. Its purpose is to collect and disseminate testimonials from some of the past and present patients of Dr. Burzynski whose cancers were successfully treated using his advanced cancer treatment. Dr. Burzynski's non toxic therapy treats cancer without the terrible side effects of conventional methods. We bear witness to the success of his antineoplaston discovery and invite the public to examine the proof, which is confirmed by our medical records. Much attention has been focused on Dr. Burzynski's antineoplaston therapy for patients who are terminally ill, and rightly so. However, the general public and most of Dr. Burzynski's patients know little about the inner workings of the clinic, the manufacturing facility, the research institute, and the highly skilled professionals who work behind the scenes at both sites. Antineoplastons are nontoxic, naturally occurring peptides, amino acid derivatives, and organic acids that fight cancer with few if any side effects. Traditional radiation therapy and chemotherapies poison cancer cells and healthy cells as well; antineoplastons cause no harm to healthy cells. Although the detailed mechanism by which antineoplastons work is unknown, they may act as biochemical microswitches to turn off the genes that cause cancer, called oncogenes, and activate the genes that fight cancer, called tumor suppressor genes. Because these drugs are harmless to healthy cells the body can be flooded with antineoplastons, and only cancer cells are affected. Patients typically carry a small pump that delivers antineoplastons directly into the bloodstream at regular intervals. Some patients take capsules orally. Researchers at Kurume University in Japan are conducting two clinical trials on antineoplastons in the treatment of colon cancer and primary liver cancer, which are major killers in that country. These researchers already have reported successful outcomes in both types of cancer. At the S.R. Burzynski Clinic, clinical trials are underway. Care and evaluation of patients participating in these trials are provided by the Departments of medical oncology and radiology. At the S.R. Burzynski Clinic, the Section of Quality Assurance, Archives Department, Department of Medical Records and Documentation, Section of Clinical Trial Documentation, and Computer System Department ensure that the trials conform to FDA standards. Here is a brief overview of what is being done at the Clinic. The Department of Medicinal Oncology employs several key individuals. Dr. Burzynski is the head of the department. Five senior physicians report directly to Dr. Burzynski and are aided by 10 research associates, who are physicians, and 1 physician assistant. Two physicians comprise the Department of Radiology. The Department of Medicinal Oncology also employs IV and monitoring nurses, medical assistants, medical technicians, pharmacists, a person who oversees the IV supplies, and a nutritionist. As head of the department, Dr. Burzynski is responsible for the overall care and treatment of patients. The senior physicians are responsible for the day-to-day treatment of patients under his supervision. The research associates have extensive contact with patients and report to the senior physician. The nurses are responsible for the daily care of patients and treatment follow-up. The physicians at the S.R. Burzynski Clinic is responsible for evaluating and maintaining patients' radiologic files. To determine the efficacy of antineoplastons, tumor measurements are determined before, during, and after treatment with these drugs. Tumor measurements are entered into a information system that allows for compilation into written reports. The Department of Medical Records and Documentation sees to it that raw data from the clinical trials are collected and stored. Together with the Section of Clinical Trials Documentation, the Department of Medical Records and Documentation documents the collection, manipulation, and storage of raw data for the clinical studies to show the safety and efficacy of antineoplastons in the treatment of different types of cancer. Antineoplastons are made at a pharmaceutical plant specifically designed and built for their manufacture in a facility that measures 46,000 square feet. The plant has been in operation since 1983 and has been updated throughout the years. In 1997, the production level of active ingredients reached 24 metric tons, which corresponds to 80,000 liters of final drug product. Thirty-eight employees work in analytical chemistry, microbiology, chemical technology, quality assurance, manufacturing, engineering, administration, maintenance, and purchasing. Three basic steps are involved in the complex manufacturing operation: synthesis of intermediate products, preparation of the drug substance, and manufacture of the drug product in the finished dosage form. The last step includes product sterilization, filling, sealing, labeling, and packaging the IV bags. The design and operation of the manufacturing facility and the production and control procedures must be in compliance with all engineering codes and strict government rules and regulations. Therefore, exceptionally qualified and open-minded engineers, chemists, and scientists are hired. This dedicated staff has a broad range of education, training, and experience. The engineers handle multidisciplinary projects that require knowledge of various types of engineering: chemical, mechanical, environmental, electrical, and instrumentation and controls. The engineers ensure that manufacturing equipment, installations, and process controls are in compliance with engineering codes and environmental and OSHA regulations. The FDA, National Cancer Institute, and independent consultants have verified that the manufacturing plant is in compliance with cGMP and cGLP. The chemists and scientists are responsible for chemical and microbiological testing. Quality control procedures consist of analytical chemistry testing of raw materials, intermediate products, drug substances, and final drug products. Microbiological testing is performed on the drug substances, drug products, purified water, and water for injections. Environmental testing also is performed to monitor microbial quality of all production areas used for drug substance and drug product processing. Antineoplaston manufacture must meet government standards for the pharmaceutical industry. The FDA has thoroughly reviewed and approved the specifications for intermediate products, drug substances, and drug products in finished dosage forms, as well as quality control methods and procedures. At the pharmaceutical plant, it is policy to exceed industry standards whenever possible. For example, as a direct result of very strict maintenance, sanitation, and control procedures, the purified water system constantly produces purified water with zero bioburden compared with the FDA recommended limit of 10,000 colony-forming units/100 mL. The dry heat and steam sterilization cycles also have safety factors much higher than those recommended. Kris Wisniewski, the Plant Manager and Director of Regulatory Affairs, has been with Dr. Burzynski since 1983. He holds master and Bachelor of Science degrees in electrical engineering and has completed postgraduate courses in analog and digital control systems. Mr. Wisniewski engineered, designed, and oversaw construction of the manufacturing facilities. He manages the complex pharmaceutical manufacturing process and ensures that the plant conforms to all codes and regulations. He is the designated company representative for hosting plant inspections conducted by federal, state, and local authorities. NOTE: This website is not intended as medical advice, and should not be relied upon as a substitute for consultation with your doctor. This website provides general information about the S.R. 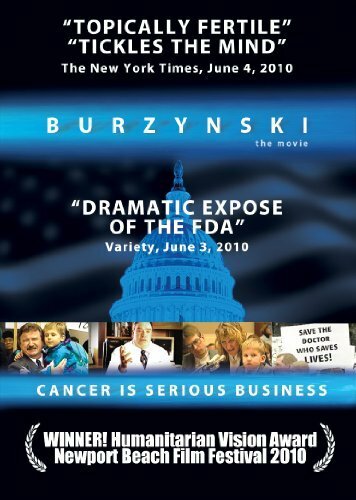 Burzynski Clinic, the manufacturing facility, and the Burzynski Research Institute and is not meant to describe all departments and their functions required by government regulations.